Hi Khatu's readers! I am Elle and I write Fast Food & Fast Fashion, a blog that is light on food and heavy on fashion. I love discussing the weather on my blog, mostly to complain about the cold and about how I can't wait to retire to sunny California or to a tropical island of my choice. It won't surprise you then that I am beyond excited for the arrival of spring and the warmer weather that accompany it. And what better way to welcome spring than with a post detailing my love of trench coats, a fall and spring staple in my closet. My style leans toward feminine - with heavy emphasis on dresses and skirts - to compensate for my masculine interior. 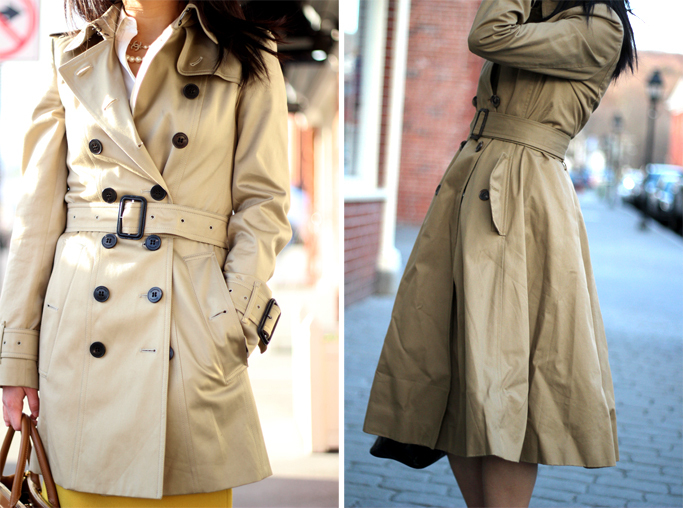 Trench coats, with their strong military influence, serve as the perfect foil to the flirtier side of my style. 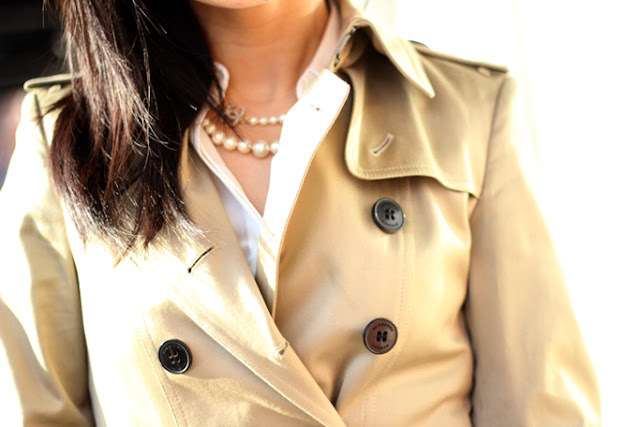 Finding the perfect trench coat is kind of like discovering a four-leaf clover - hard to find but lucky to have. In that respect, I have gotten very lucky. I used to own around ten trench coats but have since whittled down my collection to three, a reasonable number (in my opinion). I like to wear the shortest of three trench coats with pants, the just-above-the-knee length one with skirts, and the longest trench coat with dresses. I think it's because trench coats used to be part of a military officer's uniform, but they add a touch of sophistication to even the frumpiest of outfits. Do you find trench coats as enticing as I do? 10 trench coats! A fellow trench lover, I'll probably get there someday too, lol. I'm never tired of seeing you in trenches either, Elle! I have 3 trenchcoats too, all in different colors. I think all of them are of same length though. And I wear them all with absolutely everything i.e. jeans, dresses, skirts. I am looking to add (maybe not in the immediate future but down the line) a trench coat in an interesting color, which color would you recommend? I had debated getting one of the three trench coats pictured above in black but I rarely wear colors that complement black in the spring/fall so opted for khaki, which I feel is more versatile than black for trench coats. Oh I now need a new trench coat! Have you bought any of these recently? And if so where from? Super cute! I'm not a girl but I like reading these posts and i'm shorter than most of guys it makes me feel so awkward in coat. So i barely wear coat. Is there any tip for short people? Fashion related blogs give you a reflection on your fashion sense and you start checking your wardrobe also try to adopt the new fashion and trends.